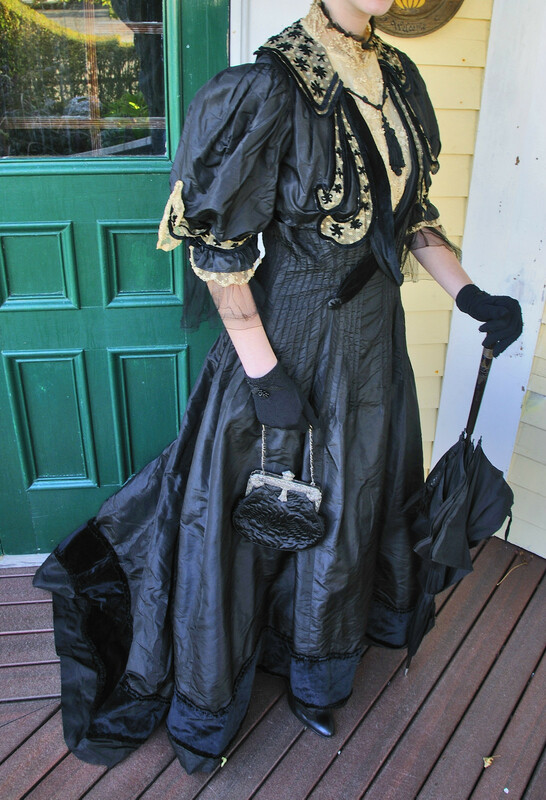 Opulent Victorian black silk & Alecon lace trained reception dress c. 1890. Magnificent, museum quality, this antique evening reception dress is the epitome of elegance!! Stunning, delicate, ecru Alencon lace with French knotted needle work adorns the neckline and front insert. The neck line is edged in black velvet, which also trims the lovely lace collar, sleeve trim and bodice decoration. A unique, elegant silk cord tassel drapes across the lace bodice insert. There are two velvet strips from the breast bone to the waist, which criss cross and are fastened by velvet covered buttons. Matching velvet draped pieces are on the back of the gown and sway as the lady walks. 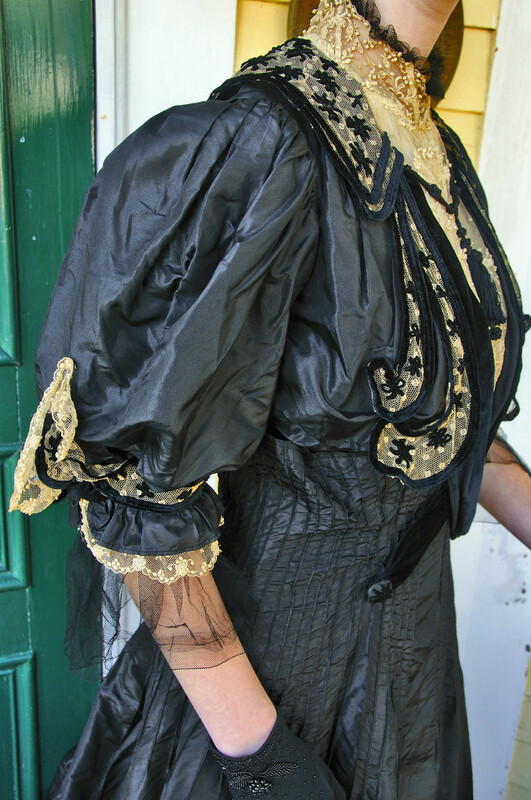 The sleeves are in the full Leg-o-Mutton style popular in the late 1890's with incredible ornately detailed lace, velvet and black tulle trim. 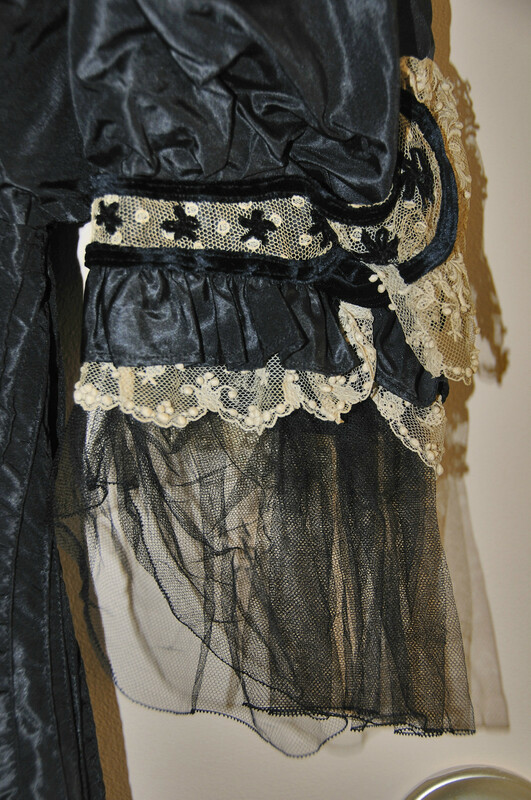 There are two areas on the sheer black tulle trim at the elbows that were mended. It doesn't detract from the dress. 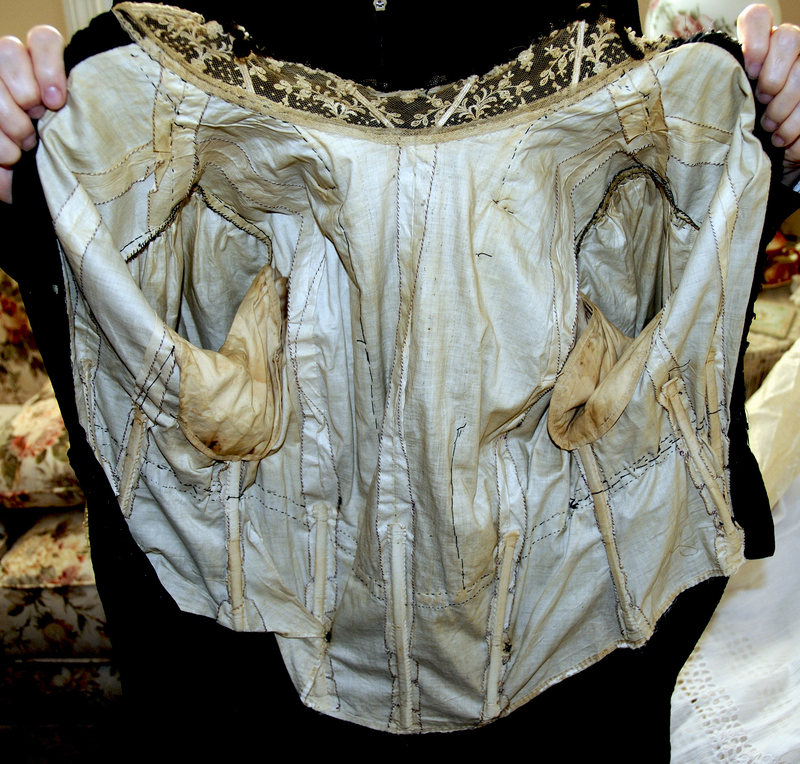 The inside bodice is fully boned and has the original dress shields. The waist front and back are stitch gathered to the hips. The bottom of the silk skirt has a gorgeous deep 6" velvet hem. The dress has a beautiful train for an elegant presentation. The back fastens with hooks and eyes. I can't do this dress justice, it has to be seen, and worn, to really be appreciated!! A perfect example of Victorian elegance at its best!!! 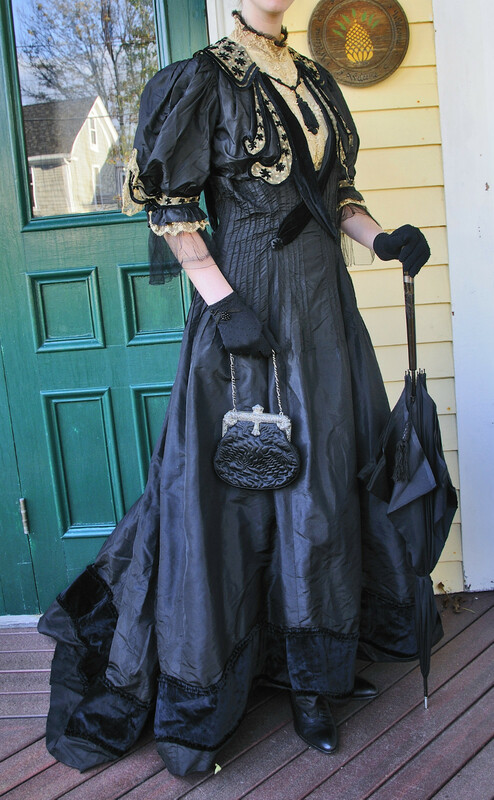 Note: Parasol, gloves, purse and shoes not included in auction. From Shoulder To Sleeve 20"
Folks, I'm not giving this away; fees, you know, so bid with confidence. It's a lovely, and much sought after, one of a kind. I am downsizing my vast collection and will be listing many pieces circa 1870-1930 in the coming days so please check back often. If you have any questions, please feel free to ask because all sales are final, unless otherwise noted. All pieces are from a non smoking home. PAYMENT IS DUE WITHIN 3 DAYS. MENTION AT CHECKOUT THAT YOU ARE STILL SHOPPING IN ORDER TO CONTINUE TO COMBINE SHIPPING. WE RESERVE THE RIGHT TO RELIST UNPAID ITEMS WITHOUT COMMUNICATION FROM BUYER AFTER 5 DAYS. THANK YOU FOR YOUR COOPERATION. I want each customers buying experience to be a pleasurable, and rewarding, one. Thank you kindly for stopping by! You can see a very similar silhouette here. 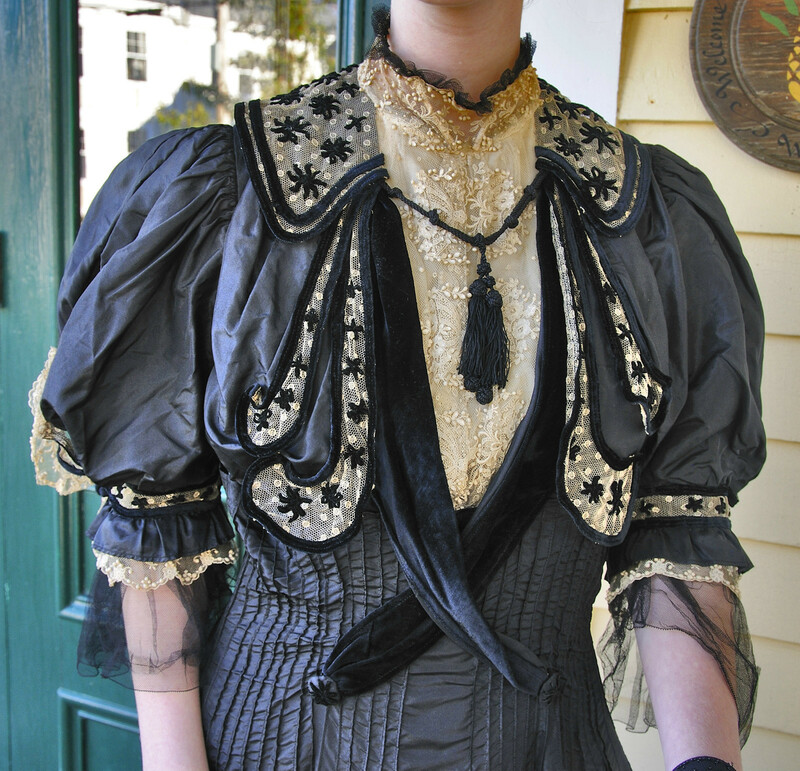 So, not Victorian but a lovely late 1900's dress that is completely drool worthy.